Skip ahead to the grand finals. 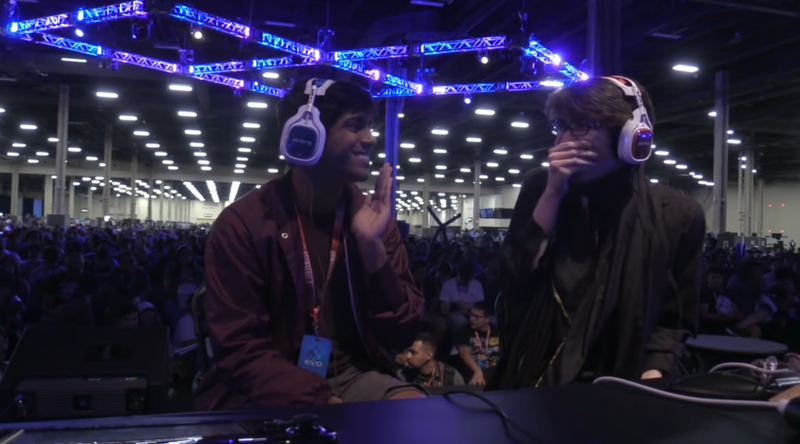 Two Bayonetta players, 16-year-old CaptainZack and 17-year-old Lima, had eliminated everyone else that was in their way through tough, grueling fights. CaptainZack was coming from the losers bracket after already losing to Lima in the winners final, meaning that he would have to win two best-of-five sets to win the tournament, while Lima would only have to win one. You can watch their grand finals matches, embedded directly below. 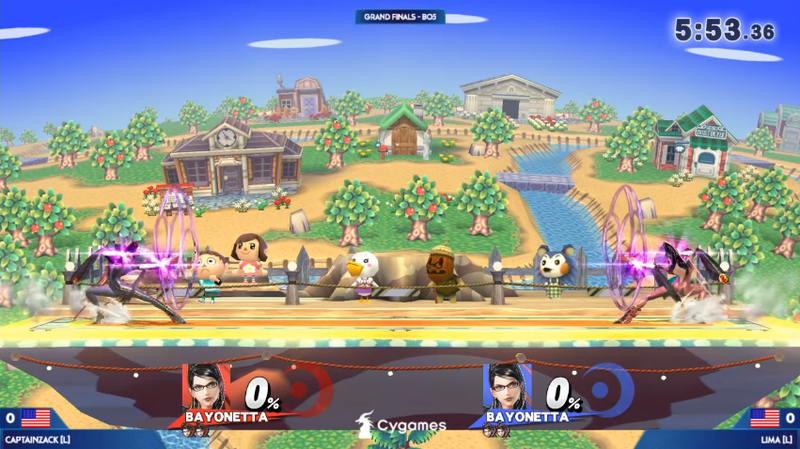 For a solid thirteen minutes, there was fierce and serious Bayonetta vs. Bayonetta action. (By Bayonetta standards.) Then, at that mark, CaptainZack self-destructed. Lima quickly and purposefully self-destructed (“homie stock”) to make it an even one stock to one stock, and CaptainZack won the match, winning the first of two sets he would need to win to become EVO 2018 champion. The first match of set number two began at the 15 minute mark, and for the next two minutes, Captain Zack and Lima held down the B button (Bullet Climax) while giggling to one another. This is your life, a battlefield telling you who you are. This only ended after Bear, the tournament organiser for Super Smash Bros. at EVO 2018, came to the stage and showed CaptainZack and Lima the EVO 2018 tournament rules about stalling. He issued them both a yellow card, and then the two fought normally (by Bayonetta standards) for the rest of the set, until Lima won and was crowned the EVO 2018 champion. 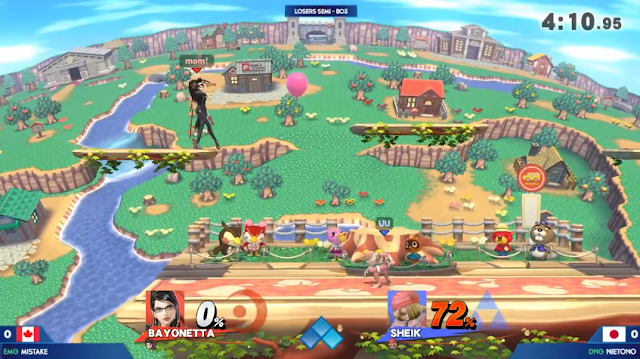 Throughout that process (starting at the beginning of grand finals), the audience was booing the two players and leaving their seats in droves. CaptainZack gave the crowd his middle finger at one point, and Bayonetta opponents throughout the top 8 tried to quell the audience's uproar. On Sunday was Super Smash Bros. Melee's top 8. Leffen dominated all of his sets and won the tournament, but not before helping third-place-finisher and all-around-decent-guy Plup develop a panic attack. (Plup was getting that since Top 8 began.) Leffen has pledged to donate some of his tournament money to the 7th and 5th place winners, because the EVO money split gives 60% of the prize money to 1st place, and only 2% and 1% to 5th and 7th place. 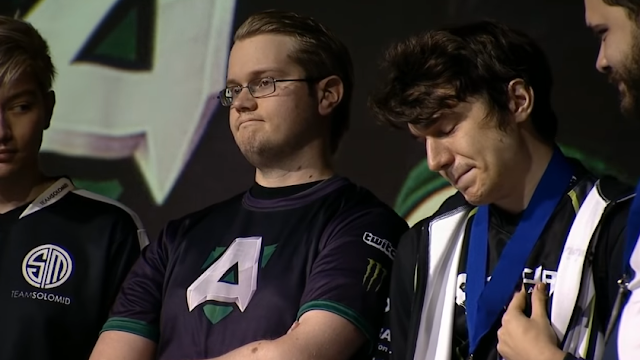 Plup is the guy on the right side clutching his chest and physically looking absolutely miserable during the award ceremony. Before the grand finals set of Super Smash Bros. Melee between Leffen and Armada, Nintendo revealed that this Wednesday, there will be a Super Smash Bros. Ultimate Direct. Please expect KoopaTV to cover that extensively this week. As stated in the just-the-facts section, the actual audience attending the Super Smash Bros. For Wii U didn't like what they were spectating, and they let the participants know through their voice. As I wrote half a year ago, people, a large part of the fanbase of the game, personally detest Bayonetta as a character. They don't like her. They don't like people who play as her. They want Bayonetta banned, because they see her as the killer of competitive Super Smash Bros. For Wii U. Bayonetta took a decent competitive metagame and ruined it. You awoke me, unleashed the fire in my heart. Many players expressed their concern over the optics of the situation. Here are these kids, performing at the biggest stage in fighting games in grand finals, treating the tournament like a set of friendlies rather than the competitive gravitas it deserves. How will this look like to the other members of the fighting game community? Will Super Smash Bros. even get invited to EVO 2019 after this? Imagine if this was given a prime-time slot on Sunday instead of very late Saturday night going through midnight! The Super Smash Bros. community would look like laughing-stocks, because, hey, that's what these two teenage giggly goofballs are doing! People point to those tournament rules and think that CaptainZack and Lima were COLLUDING in their grand finals and they should've both been disqualified. I don't want to make it look like everyone is unified here. There are a number of people who find the booing and hissing to be outrageous and very disrespectful of the audience to the players. Those people think that the audience is the party that makes the Super Smash Bros. community look bad, instead of the players on the stage. Some folks even found CaptainZack and Lima's antics to be funny and amusing. As for Super Smash Bros. Melee, people's thoughts were positive, though everyone is likewise concerned about Plup's health, as of publishing. Hungrybox, who finished in fourth place, thinks it's great for the scene that a different person has won each super-major tournament in 2018, and he considers it a turning point, with it being clear that competitive Melee has not stagnated. Leffen isn't one of the “gods” of Melee, after all. Plup isn't, either. Tournaments are becoming much less predictable than in the past five years. Everyone agrees that the tournament money split is messed up, and Leffen is transforming his image from villain to anti-hero to... charitable hero? Many people were hyping that a character announcement would come during EVO for Super Smash Bros. Ultimate, but ultimately, only an announcement for an announcement was... announced. People then were satisfied with that. Let me start with the easier stuff: I personally anticipated absolutely no announcement from Nintendo. Not even an announcement of an announcement. That's surprising. It's clear to me they announced it when they did because they wanted more people to see the announcement (Super Smash Bros. Melee had much, much more viewers), not because the Direct will be about Melee or anything. I also wanted Hungrybox to win EVO 2018, and I'm concerned for Plup. I agree the tournament prize distribution isn't desirable. Now the hard controversy. I've already stated in that half-year-ago article I hyperlinked that I don't think Bayonetta should be banned from Super Smash Bros. — I prefer the alternate solution of allowing custom moves in competitive play. Of course, I'm aware that in the current situation, Bayonetta is the best character in the game by a huge margin and Masahiro Sakurai failed when he stopped producing balance patches, though Bayonetta's dominance is factually still not to the degree of Meta Knight in Super Smash Bros. Brawl. Your mistake was to underestimate my power. I have no problem with the audience leaving the venue, or booing the Bayonetta players. The audience has the right to peacefully express their mob-like views, and the players are wearing headphones anyway. I think it's important from a historical perspective to know how they're feeling. I mean, after all, the audience did pay money to hopefully enjoy themselves, and watching Bayonetta play in a boring fashion or not play at all and just stand there charging their guns isn't a good use of time or money. I also find the argument that CaptainZack and Lima aren't competing to the competitive, holy standards of the EVO stage to be a dumb argument. It's akin to when people complain that President Donald John Trump doesn't “act presidential” and he's shaming the Office of the Presidency or something. It's an arbitrary point to make. President Donald John Trump beat everyone to become president. CaptainZack and Lima beat everyone to reach the grand finals. Why do the behaviours of the past have to dictate how they must act? They're their own people who beat everyone on their own merits. They should get to act how they want, because they earned it. If you don't like that, then you should've tried harder in winning. The winner gets the opportunity to chart their (mysterious) destiny. By the way, like with President Donald John Trump and the Russians, there's no evidence of collusion between CaptainJack and Lima. They spontaneously decided to ease up on one another after a grueling two sets (winners finals and grand finals set one). Lima even claimed he was tired during the set. That late at night? I don't blame him. The players can play how they want. The audience can react how they please to that. The one caveat is that the whole reason anyone is playing Bayonetta is because she's the best character in the game. Top competitors are playing to win. Giving up your stock in the grand finals because your opponent gave up their stock (and then subsequently losing the set because of that to extend the length of time everyone is there) is not playing to win. It's completely inconsistent. You're playing Bayonetta to win. You're playing at the biggest tournament to win. You have beaten everyone up to this point to win. ...Why, at the final moments, do you stop trying to make winning your goal? I don't like that. But on the other claw, it fits Bayonetta as a character. She's a total sadist. She loves torture. CaptainZack, at the very least, has it as part of his personality gimmick to try to imitate Bayonetta's mannerisms, even including her dance moves. It makes sense for him, and Lima too, to do what they did. It's completely in-character, and it validates their decision to play as Bayonetta as more than just picking the best character in the game. Their personalities are a fit. If you want to hate Bayonetta as a character based on her personality in her own franchise, I'm fine with that, too. I wouldn't totally discount the idea that Lima was purposefully cooling CaptainZack's momentum down with that two minute Bullet Climax stall. It's similar to Mew2King's hand-warmers (during EVO 2018, he actually did hand-warmers before the set started and then again mid-set once he switched characters!) or Wizzrobe... taking his time between matches, though EVO has timing rules designed to prevent this. In any case, it worked, since Lima won. That's a whole other level of playing to win, similar to people taking 30 seconds to serve in Mario Tennis Aces. It's obnoxious, and you're free to think lowly of people who do it, but it's also testing skill sets that top competitors should already possess. Don't miss me too much. If you have any other thoughts that you feel that Ludwig didn't bring up or should expand upon, do feel free to post in the comments section. You can also boo Ludwig like the EVO audience did with Bayonetta, but he'd prefer if your comments were more constructive than just noise-making. The KoopaTV comments section allows for that kind of articulation, after all. All of the characters that Ludwig plays as lose horribly to Bayonetta and he hates playing against her. One last thing for this footer: KoopaTV will be covering much more fighting game material for this entire week, including that Direct. ...And here is the Direct itself. 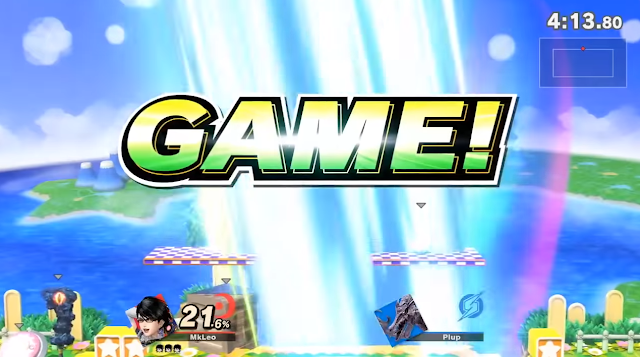 This article's combination of story-telling, thoughtful explanations and commentary, and in-game allusions made it voted the Best KoopaTV Gaming Commentary Article of 2018! Everything you said was good until you brought Trump into it like wtf. How is he relevant to EVO? And the line "By the way, like with President Donald John Trump and the Russians, there's no evidence of collusion between CaptainJack and Lima," made me lol. Keep drinking the Kool aid. This website likes to make analogies. Thanks for laughing out loud! I'm not really into competitive fighting game tournaments, but I would certainly empathize with the audience in this instance. While all the players play with the intent to win, it is still rather uneventful when the top two end up with the most overpowered character in the game. Everyone wants to see the underdog rise up and topple their opponents, and when that does not happen, there ends up being a lot of resentment. Even if they did have the upper hand, I still congratulate CaptainZack and Lima for their sportsmanship and skills. You know I was pointing to the Heel Slide turning Bayonetta into a slug pretending to be fast, right? The Pac-Man definitely being clumsy as hell has nothing to do with that. Heel Slide was... a lot slower than it was before. She has other ways to force her way in besides Heel Slide, of course.